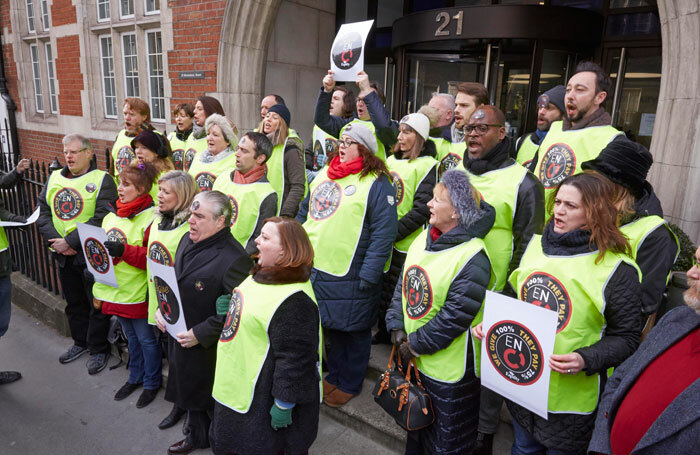 English National Opera chorus members have agreed to a cash cut, but pro rata pay rise, for the work they do at the organisation. The chorus members will only be paid to work nine months of the year instead of 12 and they will receive £35,000. This equate to a pro rata salary of £46,667. ENO had initially proposed a simple pro rata cut to chorus members’ pay from £40,900 to £30,685. This was in line with the planned move to seasonal contracts and the reduction from 12 to nine months’ work. In cash terms, chorus members have now agreed to have their pay reduced by £5,900, rather than the £10,215 original planned. They will still work on reduced seasonal contracts for just nine months of the year. ENO has also agreed to work with the chorus and Equity to find opportunities for additional work during the summer on a first refusal basis, when no work is produced at the company’s London Coliseum home. Equity said this work would “provide additional income for chorus members”, mitigating the loss to their earnings. However, Equity also said four planned redundancies at the company were still being discussed under a separate negotiation. Equity general secretary Christine Payne said she was “relieved” the dispute had been settled without the need for strike action. “In the harsh financial realities ENO finds itself, as a result of cuts from Arts Council England, the chorus have had no choice but to agree to reductions in their guaranteed pay,” she said, adding that she hoped the changes would mean the company could return to being full-time in the future. ENO chief executive Cressida Pollock said she recognised the “fundamental importance of the ENO chorus in delivering world-class opera”. “We listened to the concerns of the chorus and have reached a fair compromise that preserves the permanent ensemble, focusing on our London Coliseum season, whilst ensuring that we have the building blocks in place to increase our outside work,” she said. She added that the settlement would help the company become “more financially resilient”. The new contracts will come into effect from August 2017. Last week, ENO warned that it faced bankruptcy  if it did not implement changes to the way it runs.